Not all students can cover the cost of their college education with the grants or scholarships in their financial aid packages. Some begin their college careers by taking out student loans, while others look for part-time jobs and work-study positions. Students who are trying to avoid taking on too much debt may wonder what their job prospects look like outside of their college campuses. To help them out, we ranked the best cities in the country for working students. This is the second annual study of the best cities for working students. Read the 2016 study here. 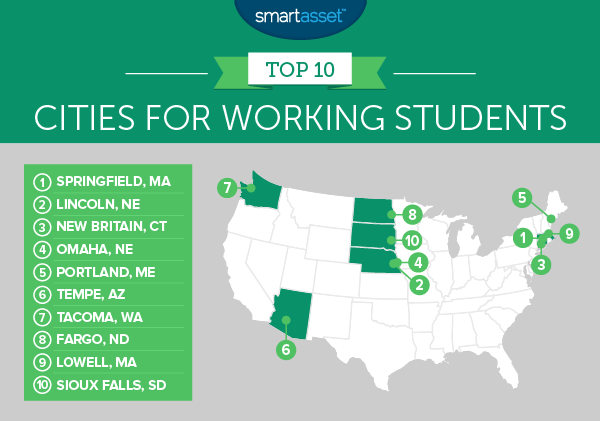 For the second year, SmartAsset took a look at the best cities for working students. Our analysis focuses on the employment opportunities for college students attending the top-ranking four-year university in 232 different cities. To complete our study, we created two different scores: a college value score (based on findings from our study of the best value colleges in America) and a jobs score (based on three factors, including the local minimum wage, the median rent and the unemployment rate for adults with some college education). It is important to note that we changed our methodology slightly this year, so this year’s study is not directly comparable to last year’s. For a full explanation of how we conducted our analysis, read the methodology and data sections below. See how long it’ll take to pay off your student loans. Minimum wages are rising. Nineteen states and dozens of cities saw their minimum wages increase at the start of 2017. Any boost in pay is sure to benefit working students and other low-wage workers around the country. Check out the Midwest. Four of the best cities for working students are located in this region, thanks in part to their low unemployment rates. In places like Lincoln, Nebraska and Fargo, North Dakota, the unemployment rate among adults with some college education is below 2%. New England ranks well. Four other cities in the top 10 are part of this region, where minimum wages are relatively high. In Portland, Maine and New Britain, Connecticut, for example, the minimum wage is above $10. Springfield is about 91 miles from Boston by car. One reason why it’s on our list of the best cities for working college students is its high minimum wage. On Jan. 1, Massachusetts’ minimum wage rose from $10 to $11. 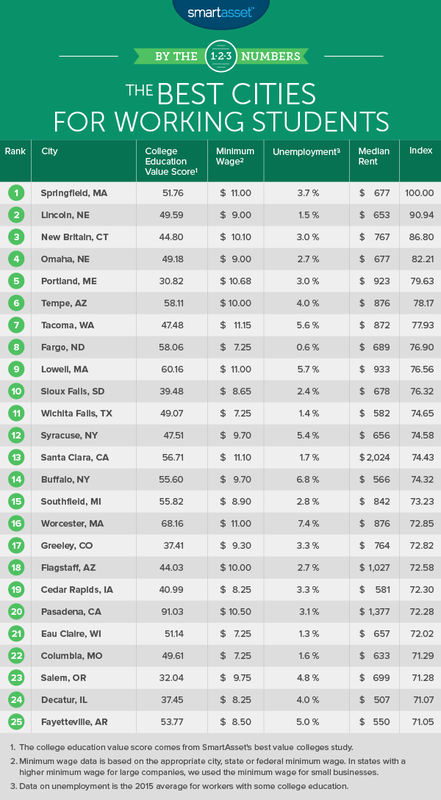 Massachusetts, Washington state and Washington, D.C. currently have the highest minimum wages in the nation. That’ll change eventually since cities and states like California are planning for their minimum wages to hit $15. In addition to having access to a lot of job opportunities, students who attend the University of Nebraska-Lincoln can get plenty of bang for their buck. Our analysis of the best value colleges found that UNL was the top-ranking university in the Cornhusker State in 2015 and 2016. New Britain has a few different colleges. Central Connecticut State University is the oldest public university in the state of Connecticut. Finding a job in New Britain shouldn’t be too difficult for students trying to pay their way through school. The unemployment rate for workers with some college education is just 3%. This is the second time that Omaha has appeared on our list of the best cities for working students. Last year, the “Gateway to the West” took the 10th spot on our list. Since we published the 2016 edition of our study, the city’s unemployment rate for workers with some college education has fallen to 2.7%. Working students in Omaha face a diverse economy. Key industries include health services, education, transportation and utilities, meaning that there are a variety of options for students looking for part-time gigs and internships. Finding part-time work may not be difficult for students in Portland, Maine. In this city, the unemployment rate among adults with an associate’s degree or some college education is just 3%. Students who live off campus may have to pay a pretty penny for rent. The median rent in Portland is $923. Fortunately, the city’s minimum wage is relatively high at $10.68. Arizona is another state that saw its minimum wage increase on New Year’s Day. In fact, it went up by almost $2. Thanks to the approval of Proposition 206, part-time and full-time workers will now earn $10 per hour. By 2020, the minimum wage will be $12. That’s good news for working students attending one of the many colleges and universities in Tempe, such as Arizona State University. Tacoma is a mid-sized city in southwest Washington. The unemployment rate for workers in the city with some college education is 5.6%. According to the Census Bureau, that’s lower than the unemployment rate among all adults in Tacoma ages 16 and over (6.5%). The state of Washington has one of the highest minimum wages in the country and Tacoma’s minimum wage is a bit higher. In 2017, working students in Tacoma will get paid $11.15 per hour. Fargo has the lowest unemployment rate in our study among workers with some college education: 0.6%. And thanks to the state’s low income tax rates, working students don’t have to worry about taxes taking a big bite out of their paychecks. Best of all, many students attending colleges in Fargo have access to a quality, yet affordable education. For the 2016-2017 school year, base tuition at the North Dakota State University – the top-ranking college in the state according to our best value colleges list – will be less than $7,000. Since we released the 2016 edition of our analysis, the median rent in Lowell has increased by about 9%. But the state’s minimum wage has risen as well. College students who need to find part-time jobs can expect to be paid at least $11 per hour in 2017. Sioux Falls is the largest city in South Dakota and has a population of roughly 171,530. The unemployment rate for workers with some college education is only 2.4%. So students have a good chance of finding a job, particularly if they’re looking for positions in one of the city’s top industries, such as the banking, food processing or bio-medical fields. To find the best cities for working students in 2017, SmartAsset found the unemployment rate (for workers with some college education or an associate’s degree) and the median rent for 232 U.S. cities with at least one four-year college or university. We also pulled the minimum wage for each of these places. We took each of our three factors (the median rent, unemployment rate and the local minimum wage) and found the number of standard deviations each city rated above or below the mean. Then we totaled those values and created a single job score reflecting the strength of the job markets in all 232 major cities. We also developed a score using the index from our study of the U.S. colleges offering the best bang for your buck (based on several factors including average starting salaries and the cost of college tuition). Whenever we had a city with multiple schools on our list of best value colleges, we looked at data for the local top-ranking school (based on our analysis). Finally, we combined our job score with our college value score, giving the job score triple weight and the college value score full weight. We created our ranking by assigning each city a score between 0 and 100. The highest-ranking city for working students received a 100 while the lowest-ranking city for working students received a 0. Note that in the 2016 edition of our analysis, we created our ranking by averaging our two scores. This year, we changed our methodology slightly to give more weight to our job-related factors. Rent and unemployment data are based on one-year estimates from the U.S. Census Bureau’s 2015 American Community Survey. Minimum wage data is based on the appropriate city, state or federal minimum wage. In some states, the minimum wage for large companies is higher. In these instances, we used the state’s lowest minimum wage (i.e. the minimum wage for small businesses). In states with a different minimum wage for small business employees with benefits, we used the minimum wage for employees without benefits. In the states with a minimum wage that’s below the federal threshold, we used the federal minimum wage. The data analysis for this study was completed by Nick Wallace.